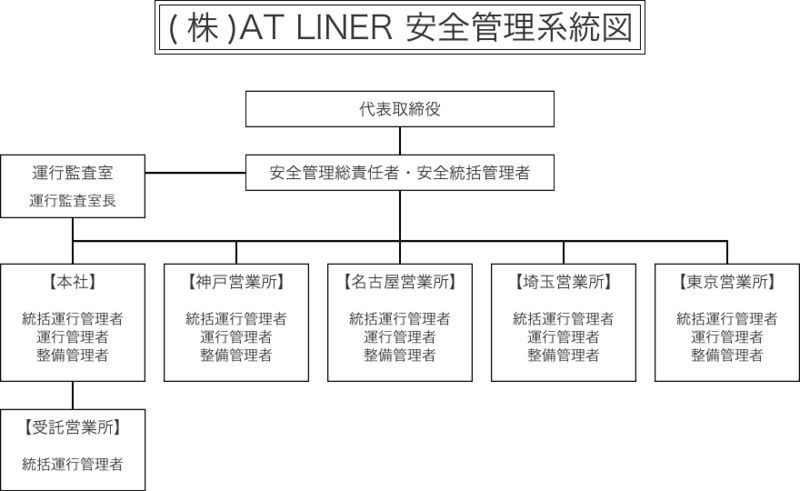 At AT Liner®, we pursue the following Transport Safety Management based on transport-related legislation and regulations. With a deep awareness that ensuring transport safety lies at the heart of business management, the Representative Director will play a leading role within the company in ensuring transport safety. The Representative Director will listen seriously to any opinions about safety on the ground and, with a firm grasp of the situation on the ground, thoroughly instill in employees the awareness that ensuring transport safety is of paramount importance. Under the Basic Policy on Transport Safety, we will carry out the following. We will thoroughly instill an awareness that ensuring transport safety is of paramount importance and comply with the provisions of relevant laws and regulations and Safety Management Regulations. We will formulate and steadily implement specific plans for education and training on transport safety. We will conduct internal audits of transport safety and implement corrective and/or preventive measures as necessary. We will establish systems for communication of information related to transport safety and communicate and share necessary information within the company. We will cooperate closely with other Group companies, striving together as one to improve transport safety. When using sub-contractors for management services, we will not behave in any way that would impede the sub-contractor from ensuring transport safety. Further, if in a close relationship with the sub-contractor, such as concluding a long-term contract, we will endeavor to improve the transport safety of the sub-contractor as far as possible. Since its foundation, AT Liner® has declared a goal of “zero accidents causing death or serious injury” and has worked to ensure safe operations. On December 3 last year, however, one of our buses was the vehicle at fault in a fatal accident. In addition to expressing our deepest apologies to the victim and her family, we understand that it is our duty to conduct a full investigation into the causes of the accident and to make every effort to ensure that the same mistake is never repeated. We will engage in transport safety from even more stringent perspectives, in our eternal mission of the elimination of all accidents causing death or serious injury. In the previous financial year, there were 35 accidents, including one fatal accident. The majority of those accidents occurred when the buses were traveling at relatively low speeds, such as in parking lots or at expressway entrances (ETC lanes), and it is believed that insufficient confirmation of safety was the cause. Taking a lesson from this, with “renewed thoroughness of safety confirmation” at the top of our minds, we have declared a target of a 50% reduction compared to last financial year, with the ultimate goal of zero accidents. Last financial year, there were 16 vehicle breakdowns during service. Due to the frequency of breakdowns caused by the degradation of plastic and other parts, vehicle maintenance will be conducted even more thoroughly than before, including a more frequent parts replacement cycle. The target for this financial year is a 50% reduction in breakdowns compared to the previous year, with the ultimate goal of their complete elimination. Copyright © AT LINER®, All Rights Reserved.